Space has been part of the Russian national consciousness for more than half a century. Since the collapse of the Soviet Union, the space industry has had a series of setbacks, but Russia is determined to retain its leading role in space exploration, and in recent years the country’s first private space enterprises have emerged. The Skolkovo Foundation’s space cluster supports innovative companies working on space technology and helps them to work in partnership with Roscosmos, Russia’s state space corporation. As Russia marks Cosmonauts' Day on April 12 - the anniversary of Yury Gagarin's first manned spaceflight in 1961 - these six Skolkovo startups have their sights fixed firmly on the stars. A Sputnix satellite orbiting a model of the Earth. Photo: Sk.ru. Microsatellite component and technology maker Sputnix produced and launched Russia’s first private remote sensing microsatellite in 2014: the Tablesat-Aurora. Founded in 2011, Sputnix launched the satellite on a Dnepr rocket launcher. It also provided the set of components for the first Kazakh cubesat. An artist's depiction of Dauria's Auriga Earth observation platform. Photo: Sk.ru. Sputnix, which held a space engineering competition as part of the Russian stage of the WorldSkills Competition vocational event in 2016, also makes educational kits for schools and universities. It has contracts with several universities around the world, including a procurement contract for an altitude control system with Montpellier-Nimes University Space Centre. Another of the company’s prospective areas of research is manufacturing in space. 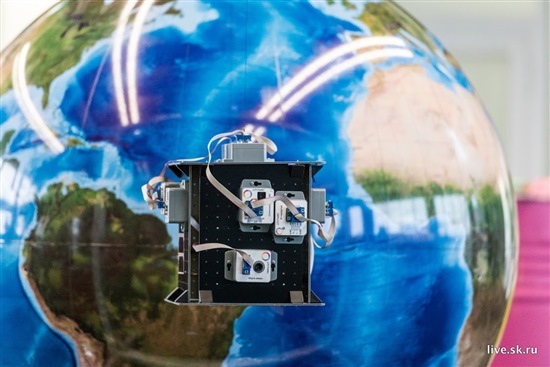 Together with Anisoprint, a fellow Skolkovo space cluster startup, Sputnix has worked on developing a 3D printer for the International Space Station that will be able to print satellites directly in space. Satellite maker Dauria was the first private space company to sign a partnership agreement with Roscosmos. Founded in 2012, the company aims to develop unified platforms of small, low-cost satellites for use in telecoms, Earth remote sensing and scientific space research. Three of its satellites – two Perseus-M nanosatellites and a DX-1 microsatellite – are already operating in orbit, and two of Dauria’s Perseus micro-satellites were sold to the U.S. earth imaging company Aquila Space. 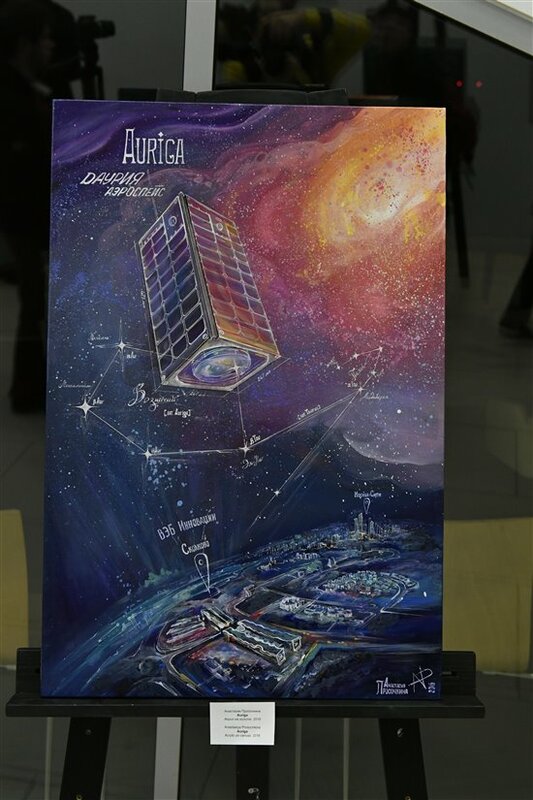 Dauria is also developing a high-resolution Earth observation platform named Auriga, and a geostationary platform for telecom satellites. Anisoprint is a resident company of Skolkovo’s nuclear cluster that was founded in 2015 by staff of the Skolkovo Institute of Science and Technology (Skoltech). Its main project is a 3D printer which, unlike most of its competitors, which simply use plastic, prints using far stronger continuous carbon fibre reinforced plastic. In 2016, the NK4 engineering centre invested $270,000 in the company after Anisoprint won a competition organised by NK4 to identify Russia’s best industrial startups. Anisoprint expects its customers to be small tech companies that need to print sturdy parts, such as robotics companies and drone-makers. Together with Sputnix, the company has already created a prototype for its space printer. Anisoprint’s CEO, Fyodor Antonov, says the device will radically impact the design of satellites. “Most of the criteria according to which satellites are designed are governed by their launch and conditions in the launch rocket,” he says. “So the main body has to be quite sturdy, because there are strong vibrations. If we make a satellite on board the International Space Station (ISS), it will never be subjected to those vibrations. “And the vibrations don’t just affect how the satellite is made; they affect the electronics too. So it can be made much lighter, and the mass of materials needed is much smaller and that’s economically profitable,” says Antonov. 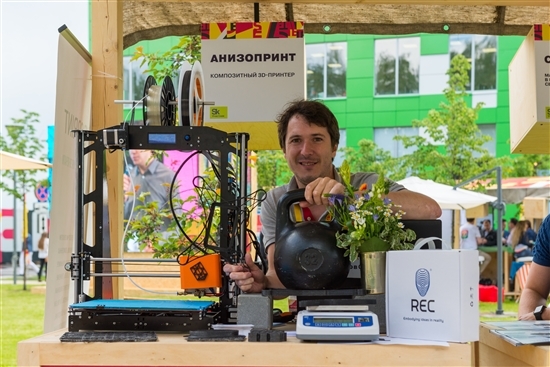 Anisoprint CEO Fyodor Antonov demonstrates a working prototype of his 3D printer for the ISS. Photo: Sk.ru. Satellites that don’t have to go through the launch process would also be less likely to encounter problems in their functioning, he says. Following the initial three-day experiment, the printer will remain on board the ISS as part of the apparatus available in the Russian sector. Any lab in the world will be able to carry out experiments using it, either by using 3D Printing Solutions as an operator, or by working directly with Roscosmos. CosmoCourse aims to become Russia’s first space tourism agency, and plans to send its first customers into space by 2020. In 2016, the space exploration enterprise became the first company to get approval from Roscosmos for its design specification for a reusable suborbital launch vehicle for tourism and scientific experiments, and in 2017, it obtained a license for its operations from Roscosmos. Tourists will be sent up to an altitude of about 200 kilometers in groups of six in a reusable capsule, in which for five or six minutes they will be able to float in micro gravity, says Pavel Pushkin, CEO of Cosmocourse. The reusable spaceship will return to Earth, landing with the help of a parachute system, and the flight will take no more than 20 minutes in total. Both the capsule and rocket will be reusable, which the company expects will enable it to keep costs relatively low. It is planned that Russia’s space tourists will depart from the Kapustin Yar rocket launch and development site in the country’s southern Astrakhan region. CosmoCourse, which was founded in 2014, believes that suborbital tourism – when passengers are flown into space at a trajectory that means they do not complete an orbital revolution – will become a more accessible alternative to orbital tourism. A handful of wealthy space tourists have experienced orbital tourism by flying to the International Space Station on board a Russian Soyuz spacecraft – after paying tens of millions of dollars and undergoing extensive training on Earth. Suborbital flights will be thousands of times shorter and hundreds of times cheaper, while training is also incomparably simpler, says Pushkin. Pushkin says the cost of a trip to space with his company will be very reasonable compared to foreign space travel agencies, and estimates the price per ticket at $200-$250,000. Another of the space cluster’s startups, Lin Industrial, is designing light launch vehicles for small satellites that it says could slash waiting times for satellite launches to three months. With the motto “We don’t promise the unrealizable – we do the incredible!” the team is working on its Taymyr launch vehicle designed to send payloads of up to 180 kilograms into low Earth orbit. The ultra-light rocket will have a liquid-propellant engine and use hydrogen peroxide as an oxidiser. Lin Industrial is carrying out its research with the support of a grant from Skolkovo, as well as from investors who include senior staff at Wargaming.net, makers of the hit computer game World of Tanks. At the request of European venture capitalists, it is also working on designing a single-stage-to-orbit reusable launch vehicle. The company has also unveiled a detailed plan to build a lunar base on the moon’s South Pole for 550 million rubles ($9.3 million) – considerably cheaper than the plans announced by both Roscosmos and the European Space Agency to build lunar research stations. Lin Industrial says it would launch 13 heavy rockets to build the base – known as Moon Seven – using existing rocket technology and materials that would enable the base to be built over a period of five years. A total of 37 launches would be required within that five-year period to support the base.